Washington head coach Chris Petersen’s Huskies are the preseason favorites to win the Pac-12 with their roster full of NFL-caliber talent, but the entire league is looking for an improved season after going 1-8 in bowl games last winter. 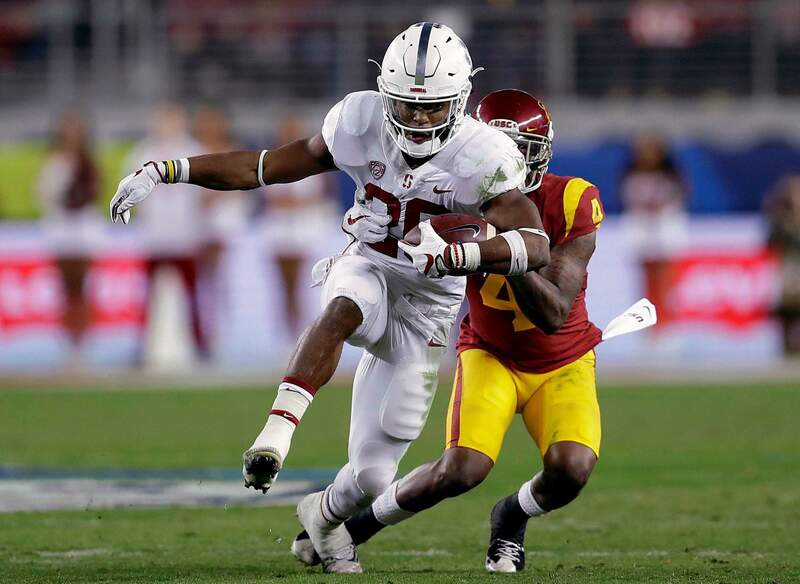 Stanford running back Bryce Love (20) returned to Stanford for his senior season after finishing as the runner-up for the Heisman Trophy last year. He leads a crop of solid tailbacks in the Pac-12. LOS ANGELES – Chris Petersen spent the past half-decade building a powerhouse at Washington, and his latest group is the strong favorite to win the Pac-12 title while leading the league’s quest to regain national respectability. 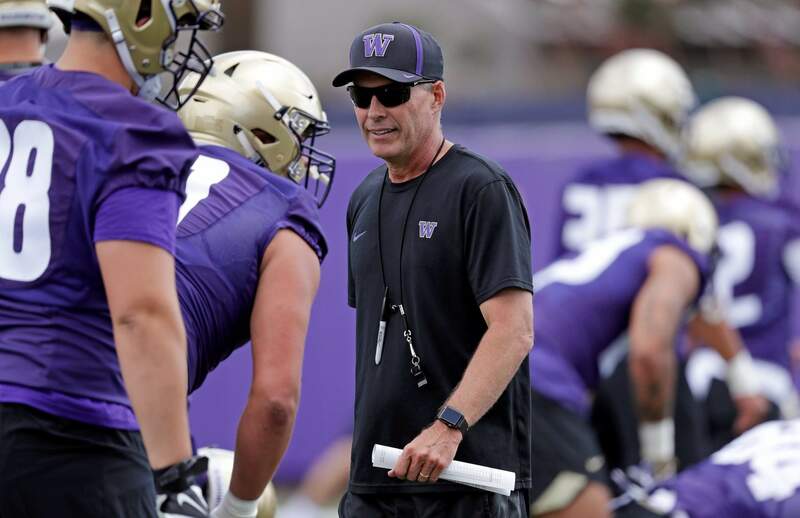 Petersen just won’t ditch his underdog worldview, even with quarterback Jake Browning and running back Myles Gaskin leading a Huskies roster stacked deep with NFL-caliber talent and chasing its second playoff berth in three years. Washington has little uncertainty anywhere, and that’s why Petersen’s team is the consensus pick to win the West. CHIP PART 2: Chip Kelly led the speed-based revolution in college football and won three Pac-12 titles during his four-year tenure as Oregon’s head coach. After two stints in the NFL and a year as a broadcaster, Kelly was enticed back to the college game by UCLA and its deep-pocketed boosters, who are determined to put the Bruins on equal footing with crosstown rival Southern California. Kelly could start slowly with a mixed bag of talent, including no standout starting quarterback and little experience at receiver. LOVE ON THE FARM: Heisman Trophy runner-up Bryce Love defied most predictions and the conventional wisdom around tailbacks by returning to Stanford for his senior season. The human biology major is determined to graduate in December to protect his dream of going to medical school, but his return also sets up the Cardinal for another season of their punishing ground game with Love running behind four returning starters on the offensive line. Stanford also has four returning receivers for K.J. Costello or whichever quarterback claims the starting job. HERM’S HEAD: Aside from Kelly’s return, the most intriguing new hire among the league’s five new coaches is Herm Edwards. The veteran NFL boss is also the biggest risk: Although he enjoyed modest success with the Jets and Chiefs, Edwards hasn’t coached anywhere since 2008, and he hasn’t been a college coach since his three-year stint as San Jose State’s defensive backs coach in the 1980s. USC’S NEXT QB: Sam Darnold has left USC for the New York Jets after one Rose Bowl victory and one Pac-12 title. He also left a void behind center for the Trojans, and three young passers are competing in camp to become the next passer in their school’s enviable lineage. Jack Sears and Matt Fink have advantages in experience, but touted freshman J.T. Daniels is making early strides. WILDCAT STRIKE: In his first season at Texas A&M, Kevin Sumlin coached a relatively unsung, athletic quarterback to a surprising Heisman Trophy. Six years after Johnny Manziel did the improbable, Sumlin is taking over at Arizona with the chance to make a star out of Khalil Tate, the dual-threat QB who passed for 1,591 yards and rushed for 1,411 more while starting just nine games last season.